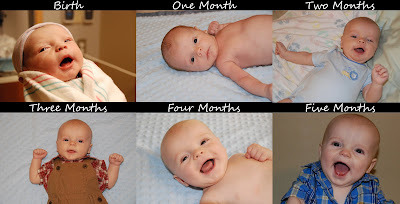 The MacGregor Family: Happy 5 Month Birthday, Jackson! 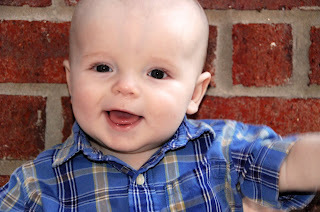 Jackson - It has been exactly five months since you have changed our lives forever. You have changed so much over time. (You should be able to click on the pic below and see a larger version of it.) You have especially changed this month. A month ago you were just learning how to roll over. You are now a pro at rolling onto your tummy. Usually, as soon as we put you on your back, you roll over and push yourself up on your arms. Unfortunately, you no longer really like to roll from your tummy to your back. We have it on video, so we know we didn't imagine it. You can now fully extend your arms when you push yourself up and hold yourself up for quite a while. You try and try and try to crawl as well. But, you haven't figured out that your arms and legs have to be on the ground to do so. Instead your legs and arms move together a mile a minute in the air. It looks like you are flying, except your tummy is on the ground. You cannot wait to be mobile. We think that you think you can walk. When you are standing on one of us and you see someone you want to go to, you try to walk to them. One day Jackson... You are extremely interested in whatever it is we are eating or drinking. 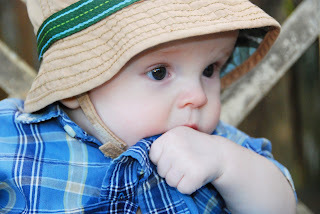 Although many people start their babies on foods at 4 months, our doctor doesn't recommend it. Therefore, you will have to wait. We're not ready for all that mess yet anyway. You were the sickest you've ever been this month. We hope that when you wake up tomorrow you will not be sick anymore. We are ready for a healthy baby! You have pooped and vomited more this month than ever. Mommy and Daddy are becoming pros at cleaning your car seat as well as your crib sheet and mattress. You've gotten much better at not peeing on us when we change you, but you did get Mommy once this week at 4am while we were taking your temp. Despite being so sick, you still smile all the time. No matter what happens, when you smile, it's all better. This month you met some family you had not previously met and gained some family as well. You were able to meet your Uncle Stephen, Auntie Penny, Cousin William, Cousin Neil, Great Uncle Stephen, and Great Auntie Ro. You gained your Aunt Melissa and your Cousin Chelsea this past weekend. You attended your first baby shower (other than when you were in Mommy's tummy) and probably your last baby shower. Even though you were getting sick, you were a perfect angel. Jackson, you have always been a very observant baby, but even more so now. You love to watch your Mommy and Daddy, especially. Just today, you were watching your Daddy do a silly dance for you, and you were trying to copy him with the biggest grin on your face. We learned that you do not like all medicine. With all your illnesses, you have been a walking pharmacy for the past two weeks. You like your reflux medicine and your Tylenol, but hate the antibiotics. You also hate Pedialyte. You still love fans, but not as much. You love your toys (especially your worm, elephant, kid town, exersaucer and the musical reach toy) you love books and you love Ms. Brittany from daycare. You are starting to recognize/remember people other than just Mommy and Daddy. Mommy might be imagining things, but when you cry, it sounds like Ma at the end. 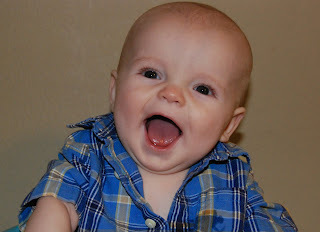 Oh, yes, and you are teething... joy of joys. Jackson - We love you so much. 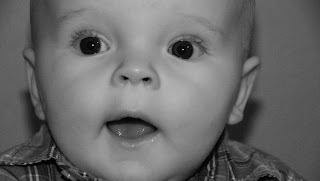 He is such a perfect Gerber baby: just adorable. I'm so happy y'all are feeling better and hopefully Jackson's on his way, too. We kept Will off baby food until he was six months, just so I could put off the diapers... green beans diapers are NO FUN. We too started the baby food around six months. If you want to make your own food, I'd love to help. It's really easy when you have a food processor. It will also save a ton of money. J has to be one of the smiliest kids I've ever seen. He is so cute. I love the newest pics. I can tell he has a great personality. 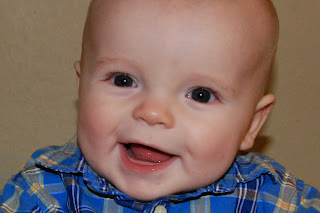 Happy 5 months, Jackson! I hope this month is healthier than the last one.